Many of us already understand the benefits of being custom fit for golf clubs so that the length, lie and loft of the club combine with the right type of shaft to give us the optimum level of shot performance for our individual golf swings. It makes perfect sense. However, how many people have been fitted for the one piece of golf equipment you use on every stroke, namely the golf ball? 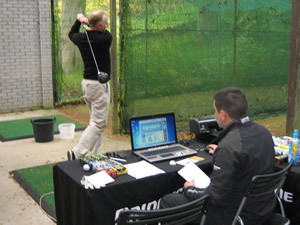 Short of trial and error it is quite hard for the average golfer to be fitted. Bridgestone recognise this and for a number of years they have been running Ball Fitting Challenge sessions at golf clubs throughout the world. You may be wondering why this needs to be done at all, so if you can follow a little physics then I shall explain. When you hit a golf ball it compresses from a sphere to an elongated oval, and then back again. This is called deformation. If a ball deforms properly then you get less spin resulting in longer carries and better accuracy, providing of course that you have a good launch angle. Due to high clubhead speed the driver deforms the ball the most. A straight face and longer shaft creates the maximum clubhead speed of any golf club. At the other end of the scale, short irons deform the least because of their slower speed and more glancing angle of attack, due to the higher loft. Bridgestone's range of balls feature four different layers. They start with a soft core in the centre and then get firmer as you move out. They claim this enables the ball to deform more at impact. They are so confident in their designs they are even willing to compare their balls to any ball in the market. 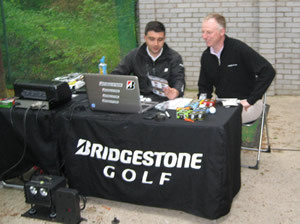 I was intrigued, so I went to a Bridgestone Golf Ball Fitting Challenge at my local golf club where Joe was ready with Bridegstone's proprietary launch monitor called Science Eye. As a benchmark for the challenge, I decided to put up the UK's number one selling 3-piece ball, the Titleist Pro V1, against the Bridgestone range to see what happened. After 6 shots with the Titleist we analysed the data and Joe suggested I try the Bridgestone B330-RXS golf ball as this was the model that most closely matched my 102mph swing speed. After 6 swipes with the Bridgestone, it did indeed increase my ball speed by a couple of mph along with 200rpm less spin, resulting in around another 8-10 yards total distance. As the softer B-330 RXS is also a lower spinning ball, the side spin also reduced, which also improved my accuracy. The whole process took less than 15 minutes and at the end of it I received a print out of the results and a sleeve of the recommended Bridgestone ball. Had the results had shown the Titleist was best, Joe said he would have been happy to recommend that I continue to use it. What I took away from the session was that there is a whole world of compression and layer construction factors that influence how a ball performs when you hit it. In the old days most balls had 100 or 90 compression stamped on them, but even this was usually just a guide covering a range of actual compressions. Nowadays balls are much softer with 3, 4 or even 5 layers. The Titleist Pro V1x is around a 93 compression ball and the Pro V1 is about 80. Their range starts with the Bridgestone B330 golf ball, designed for Tour level swing speeds at 77, the B330-S at 74, the B330-RX at 65 and the S version I tried at 64. These are all significantly lower than some of the leading balls in the market and the performance is pretty good too. It was a real eye opener to see all the differences in performance. I now understand why manufacturers have four, five, six or even more models in their ball ranges, matching different performances and price levels. Most of the people who attended the same session came away with a lower compression ball that would give them more distance. Everyone's swing is different and the recommended ball will differ from player to player, so check out the Bridgestone Golf website for the next Ball Fitting Challenge day near you. Alternatively you can enter your swing details into their online Golf Ball Selection Guide, which was also pretty accurate at recommending the right ball for you to try. Overall the whole process was informative, educational, fun and really made me think about what type of ball I need and the comparison with competitor balls makes the Bridgestone Ball Fitting Challenge something I would recommend to every golfer. How to choose the right golf ball the Titleist way.